Now that you've seen the details of class inheritance in the previous chapter, it is a good time to take a step back and look at Scala's class hierarchy as a whole. In Scala, every class inherits from a common superclass named Any. Because every class is a subclass of Any, the methods defined in Any are "universal" methods: they may be invoked on any object. Scala also defines some interesting classes at the bottom of the hierarchy, Null and Nothing, which essentially act as common subclasses. For example, just as Any is a superclass of every other class, Nothing is a subclass of every other class. In this chapter, we'll give you a tour of Scala's class hierarchy. Because every class inherits from Any, every object in a Scala program can be compared using ==, !=, or equals; hashed using hashCode; and formatted using toString. The equality and inequality methods, == and !=, are declared final in class Any, so they cannot be overridden in subclasses. In fact, == is always the same as equals and != is always the negation of equals. So individual classes can tailor what == or != means by overriding the equals method. We'll show an example later in this chapter. The other value class, Unit, corresponds roughly to Java's void type; it is used as the result type of a method that does not otherwise return an interesting result. Unit has a single instance value, which is written (), as discussed in Section 7.2. Note that the value class space is flat; all value classes are subtypes of scala.AnyVal, but they do not subclass each other. Instead there are implicit conversions between different value class types. For example, an instance of class scala.Int is automatically widened (by an implicit conversion) to an instance of class scala.Long when required. Here's how this works: The methods min, max, until, to, and abs are all defined in a class scala.runtime.RichInt, and there is an implicit conversion from class Int to RichInt. The conversion is applied whenever a method is invoked on an Int that is undefined in Int but defined in RichInt. Similar "booster classes" and implicit conversions exist for the other value classes. Implicit conversions will be discussed in detail in Chapter 21. The other subclass of the root class Any is class AnyRef. This is the base class of all reference classes in Scala. As mentioned previously, on the Java platform AnyRef is in fact just an alias for class java.lang.Object. So classes written in Java as well as classes written in Scala all inherit from AnyRef. One way to think of java.lang.Object, therefore, is as the way AnyRef is implemented on the Java platform. Thus, although you can use Object and AnyRef interchangeably in Scala programs on the Java platform, the recommended style is to use AnyRef everywhere. Scala classes are different from Java classes in that they also inherit from a special marker trait called ScalaObject. The idea is that the ScalaObject contains methods that the Scala compiler defines and implements in order to make execution of Scala programs more efficient. Right now, Scala object contains a single method, named $tag, which is used internally to speed up pattern matching. How is all this implemented? In fact, Scala stores integers in the same way as Java: as 32-bit words. This is important for efficiency on the JVM and also for interoperability with Java libraries. Standard operations like addition or multiplication are implemented as primitive operations. However, Scala uses the "backup" class java.lang.Integer whenever an integer needs to be seen as a (Java) object. This happens for instance when invoking the toString method on an integer number or when assigning an integer to a variable of type Any. Integers of type Int are converted transparently to "boxed integers" of type java.lang.Integer whenever necessary. You will find that you get false! What happens is that the number 421 gets boxed twice, so that the arguments for x and y are two different objects. Because == means reference equality on reference types, and Integer is a reference type, the result is false. This is one aspect where it shows that Java is not a pure object-oriented language. There is a difference between primitive types and reference types that can be clearly observed. In Java, the result of comparing x with y would be false. The programmer should have used equals in this case, but it is easy to forget. Equality in Scala is discussed further in Chapter 28. 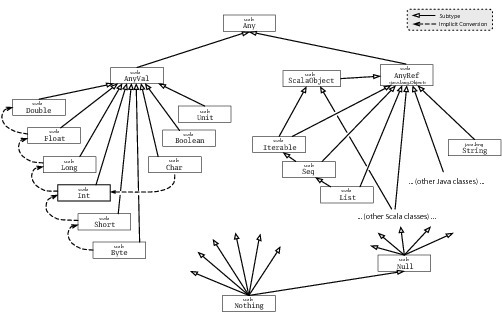 At the bottom of the type hierarchy in Figure 11.1 you see the two classes scala.Null and scala.Nothing. These are special types that handle some "corner cases" of Scala's object-oriented type system in a uniform way. The "then" branch of the conditional, x / y, has type Int, whereas the else branch, the call to error, has type Nothing. Because Nothing is a subtype of Int, the type of the whole conditional is Int, as required. In this chapter we showed you the classes at the top and bottom of Scala's class hierarchy. Now that you've gotten a good foundation on class inheritance in Scala, you're ready to understand mixin composition. In the next chapter, you'll learn about traits. The reason the AnyRef alias exists, instead of just using the name java.lang.Object, is because Scala was designed to work on both the Java and .NET platforms. On .NET, AnyRef is an alias for System.Object. You hash cons instances of a class by caching all instances you have created in a weak collection. Then, any time you want a new instance of the class, you first check the cache. If the cache already has an element equal to the one you are about to create, you can reuse the existing instance. As a result of this arrangement, any two instances that are equal with equals() are also equal with reference equality.